Bring me a stein of mead and a wench or gent to feed me mutton! Whoa. Sorry about that outburst. With the Central Coast Renaissance Festival coming to town, I’ve developed what can only be described as a case of Elizabethan Tourrettes. Actually, a few of you readers believed thy county be a hideous flax-wench after the announcement of mass evictions looming over Sunny Acres. “Best yet—couldn’t have said it better than that!” Becky Jorgeson wrote. Then I got forwarded an e-mail that was originally sent to Editor Ed Connolly and Staff Writer Colin Rigley. “I want to sincerely thank you on behalf of the whole Sunny Acres crew, including my ‘sensie’ Dan DeVaul, for the matter-of-fact article and saying ‘through the eyes of The Shredder’ what needed to be put in print,” Matt Lombardini wrote. Hey, Matt! I appreciate the props, but you gave it to the wrong guys. I finally write something that resonates and you shovel all the credit to someone else? Dude! Forsooth, where are my kudos? Not all the letters were as pleasant, though. I don’t know if you’ve checked housing listings lately, but $300 won’t even buy the right to look at a crappy apartment in this county, let alone live there for a month. But let’s not squabble over rent prices. OK. You caught me. I do want to take away your guns. And I’m assuming you mean Obama, but you may want to check Urban Dictionary for other, more juvenile definitions before flinging around phrases like “the big O.” Let’s read on. I whole-heartedly agree with your agreeing with me. That reminded me of another series of letters I received not too long ago from Michael Larrea that had nothing to do with Sunny Acres, but still made me laugh. Hey! Wait a minute! Which Bush? SLO City Manager Katie Lichtig—formerly of Bevvverly Hiiils (pronounced all snooty)—has been hearing from her fans, too. A brief recap: New Times reported that SLO’s Sustainability Task Force, which was designed to help the city crawl out of its budgetary hole using local public input, was comprised mostly of people who aren’t local getting together in a group closed to the public. Feast ye all your eyes on yon demon hypocrisy. The city’s private club irked all of us here, and apparently got under the skin of local firefighters and police, too. In a press release penned by San Luis Obispo City Firefighters Local 3523 President Erik S. Baskin and San Luis Obispo Police Officers Association President Matt Blackstone, they formally removed themselves from the secretive taskforce for the very same reasons we said it was a farce. “The task force’s composition was far from average citizens of SLO, and was comprised largely of elite of special interests and insiders within the county—the majority of which are Chamber of Commerce past and present board members, CEOs, business owners, top management officials, and city department heads—unreflective of the community at large,” they said in the release. The unions should be applauded in their efforts to fight for full disclosure. But come on. These guys didn’t want to be part of a task force tasked with shrinking exorbitant public salaries that are now commonplace because of binding arbitration. Public unions will soon head back into negotiations with the city, which will probably go to arbitration, which probably means garbage trucks full of money are being loaded up to pay next year’s salaries as we speak. Verily, thou art naught but a lumpish, fen-sucked dewberry! 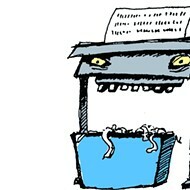 Hearken ye thou’st letters of praise to ye ol’ Shredder at shredder@newtimesslo.com.